Inhabitants of Hawaii. Sandwich Islands. 18th c.
Home » Inhabitants of Hawaii. Sandwich Islands. 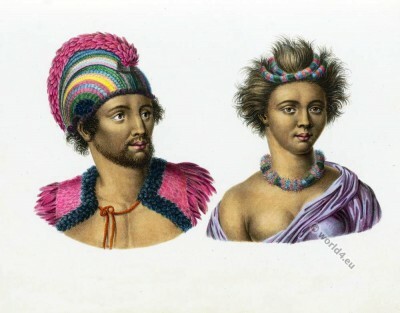 18th c.
Inhabitants of Hawaii. Sandwich Islands. The term Sandwich Islands represents two of James Cook after John Montagu 4th Earl of Sandwich called archipelagos. Hawaii and South Sandwich Islands. Sandwich Island is the former name of Manuae (Cook Islands). Manuae was discovered on September 23, 1773 by the English navigator James Cook, making it one of the first islands that sighted Cook on his voyages of discovery in this area. He named the atoll originally Sandwich Islands, changed this name later in Hervey Island. The name Sandwich Islands was transferred to the archipelago of Hawaii. Hawaii is an island chain in the Pacific Ocean. The archipelago is considered one of the South Sea Islands. The nickname of Hawaii is “Aloha State”. On January 20, 1778 James Cook landed on his third Pacific voyage on the southwest coast of the island of Kaua’i, which had been spotted already on January 18. Cook operating barter with the natives and had next to pigs and goats also diverse seeds back. However Cooks crew infected the local indigenous people with sexually transmitted diseases, which caused the population to shrink 300,000 to 60,000 within the next 80 years. This entry was posted in 18th Century, Oceania, Sandwich Islands and tagged Traditional Oceania costumes on 5/7/15 by world4.